The 2016 lineup of Rainbow is ready to record any time Ritchie Blackmore wants them to, says bassist Bob Curiano. They’re gearing up to play a handful of shows in June, after Blackmore decided to return to rock music for the first time since splitting Rainbow in 1997. Curiano – a former member of Blackmore’s Night, who appeared under the name Sir Robert of Normandy – is currently using the stage title Bob Nouveau. His comments come after former Rainbow frontman Joe Lynn Turner said Blackmore’s latest lineup would tarnish the band’s legacy if they didn’t record. 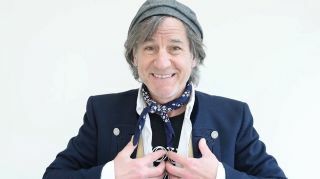 Curiano has recorded an introductory video, explaining his latest stage name by spoofing Deep Purple classic Perfect Strangers. He’s also streamed a track entitled Let The Rainbow Shine as a tribute to Blackmore and the band’s fans.